/ Passage on the first part of "Pinza"
Route 732 is an old style All Mountain trail. The elevation gain is close to 1700 metres, with some of the climbs pretty tough, and long stretches on road. Along the almost 40 km of the trail, the scenery changes often and is definitely breathtaking but it is not a tour for everyone. The mountain huts Nino Pernici and Grassi are classic destinations for anyone familiar with Garda Trentino. The proposed descent is truly wild, either you love it or you hate it. The terrain is rocky, very rough and quite steep; for anyone who is not at their ease in this kind of terrain it could turn out to be a nightmare. From Campi onward, the track surface is much more stable and easy. The final part, on cement, has a gradient of more than 20% with a view over Riva and the Upper Lake that is simply impossible to describe. On this final stretch, you have to check your speed and make sure to use both brakes as needed, especially if wet and in the autumn. This all mountain tour is suitable also for fat bikes. Attention! The Route is currently closed for maintenance. Opening is planned for April 2019. 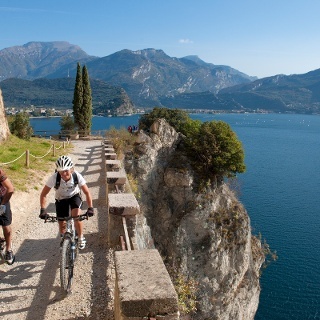 The trail starts out on the lake front in Riva del Garda, in front of the Garda Trentino tourist information office. Take the cycle path which leads along Viale della Liberazione towards the centre of Riva. Pass the imposing structure of the Rocca and Piazza 3 Novembre, coming to the main road Gardesana Occidentale at the harbour. From here, follow the main road to the south for a few hundred metres. Before you reach the first tunnel on the Gardesana, keep to the right and take a steep cobbled ramp which leads to the start of the famous “Ponale” trail. This stretch of the route, on a dirt road, has an incomparable panorama. Without any alternative trail suitable for a bike we come to the end of the dirt road at the Ponale Alto Belvedere snack bar. At the nearby junction, keep right in the direction of Lake Ledro. You come to the main road at the exit of the tunnel and follow it uphill for a few hundred metres, then turning left in the direction of Pregasina. Immediately after you cross the bridge, take the dirt road on your right. The trail to follow to get to Lake Ledro is clear. Cycle through Pre and Molina as far as the lake. Following the road and subsequent road signs, cycle along the left side of the lake until you come to Pieve at the far end. Here you cross the main road and head towards the centre of the village. Signposting in the narrow streets lead you to the left where you take a short stretch of cycle path. 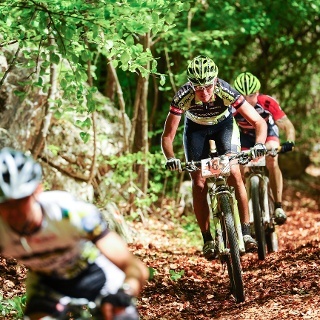 This takes you to the start of the peaceful Val di Concei. Keep on straight along the main road, heading up the valley. Cycle through Locca, Enguiso and, when you get near Lenzumo, take the road on the right leading to Bocca di Trat and Rifugio Nino Pernici. On this stretch, the signposting is very clear, and in any case, one thing is certain; it’s all uphill, and plenty of it. After a long stretch on the road, as you near your destination, the road turns into a dirt track. When you come to the pass, you will find the mountain hut Rifugio Nino Pernici on your right, a historic destination for local mountain bike enthusiasts. From Bocca di Trat, the direction for the descent is clear, so head down the other side, in what, in certain stretches, feels like a steep stream of rocks. 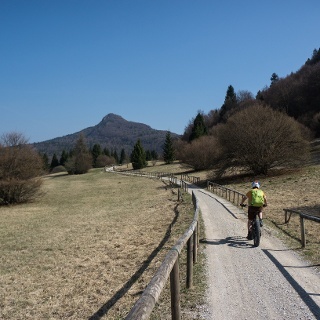 Once you get to the meadows of Malga Pranzo, turn right towards the nearby mountain hut Capanna Grassi, another popular destination with local bikers. Take a break it you like, then head down over the meadows of Malga Grassi to resume the descent. After the first stretch, nothing is going to surprise you, but if you prefer to avoid another treacherous stretch, you can go as far as the outskirts of Campi following the abandoned road that passes by Malga Pranzo. Before coming to the town centre, turn right and follow directions for tour 735. This takes you back to routes 732 and 734 which are part of the famous “Pinza”; steep, but very stable compared with the previous stretches, then cemented on the final stretch. However, if the previous stretch didn’t bother you and you want to continue on what was the race track for the “Adrenalina” competition (a downhill race which goes back to the origins of this discipline in this area), just follow the clear signposting from Capanna Grassi. Cross the wide meadows on an easy dirt road, head into the woods, cross the stream, and you come to a short stretch where you need to push your bike uphill. At the stream, part of the road has collapsed so take great care because the passage is currently rather narrow. Once you are over the hill, your downhill adventure begins among the rocks. The few turn-offs are clearly marked and, once you have done the final stretch on cement, you pass in front of the church of San Rocco, continuing on to the start of the “Pinza”. From here on, you are on a dirt track once more, but it is stable and fairly easy. Mind your speed though because even though the trail is quite wide some stretches are very exposed. Take your time and enjoy the panorama on the last stretch which is almost entirely on cement. Your brakes will be red hot. 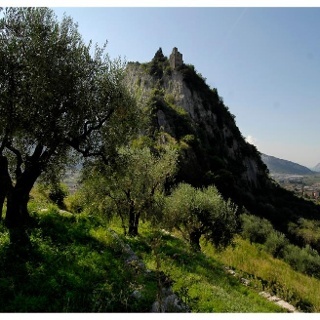 At the end of the descent, you are practically at the entrance to the centre of Riva del Garda, your point of departure. Bel giro nel complesso, unica pecca il tratto di discesa tra il Rifugio Pernici e la Malga Grassi non adatta ai neofiti. Der Uphill zum Rifugio ist sehr gut zu 90% geteert und dann auf Schotter. Allerdings ist der Downhill bis Campi wirklich nicht schön. Es geht nur durch mangogroße Felsbrocken und ein kurzes Zwischenstück ist so steil und unwegsam das man schieben muss was ja nicht schlimm wäre. Allerdings ist dort die Böschung abgesackt sodas der Weg nur 30cm breit ist uns es neben einem gut 10m senkrecht geht. Wirklich gefährlich beim vorbei schieben/tragen. Wenn die Route gerade neu beschildert wird sollte man vielleicht eine andere Abfahrt bis Campi finden. Ab Campi dann sehr gut mit der Abfahrt die man auch von der 735 oder 734 kennt. Sehr schöne Tour, vor allen für die, die längere Anstiege lieben. Das Rifugio Pernici liegt traumhaft, weniger traumhaft war für mich ein Teil der Abfahrt. Man muss loses Geröll und große Steine lieben. Der ein mags der andere nicht. Ansonsten heißt es immer mal wieder ein Stück schieben. Nervig ist es in der Hauptreisezeit auf der Ponalesstraße. Hier denkt mittlerweile jeder, das er da hoch fahren muss. Ob unerfahren oder untrainiert mit dem E-Bike oder dem City Bike, es ist ziemlich nervig. Ambesten früh morgens um 06.00 Uhr oder in der Mittagszeit wenn es richtig heiß ist, da ist deutlich weniger Betrieb.